*FREE* 20th Anniversary Event for HwnExp... yup... FREE! I went down on March 20th, 1995 to apply for my GE Tax license. To celebrate, we're hosting a FREE show open to all ages. *Each of the bands performing has a strong tie to the record label... and its a FREE show for all ages at a great venue. Come down and bring a friend. We will also have lots of free items to give away and perhaps a raffle as well. and the debut of a brand new Old Habits Die hard CD-ep! Hope you can make it!! Donations and Support so far from Jenn Matthews Tattoos, Machete Merch, Aloha Subs, Underworld Events and more. Keep scrolling for details!! Not in this order / Lineup subject to change. Lots of giveaways and prizes. I went down to sign up for my GE Tax license on march 20th, 1995. 20 years later (to the day) we celebrate all that's taken place since. Each of the bands performing has a strong tie to the record label... and its a FREE show for all ages at a great venue. Come down and bring a friend. 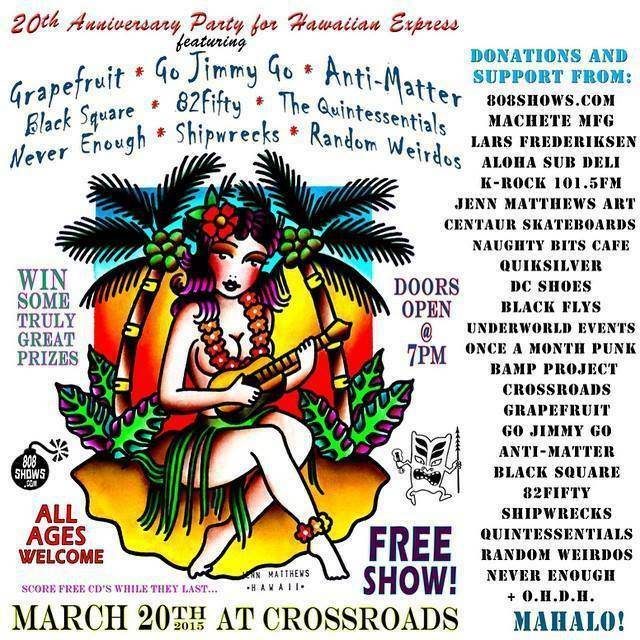 - Misc product DC Shoes, Black Flys, Quiksilver, Once A Month Punk, ANTI-MATTER, and 808shows.com / Hawaiian Express! - Perhaps more if additional donations come in!! 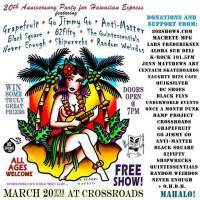 Mahalo to Crossroads, K-ROCK 101.5FM, and all of the bands for their support as well! Again, THIS A FREE ALL AGES SHOW!! !